Tang Smoke and other names that POP! I love bizarre band names. Tang Smoke, Low Hanging Fruit, Half Man Half Biscuit — the wackier the better. Unfortunately if you’re a marketer, you can’t always go with the “Wackier the Better” plan if you’re developing a name for a product or tag line. Sam Horn, author of the book POP! 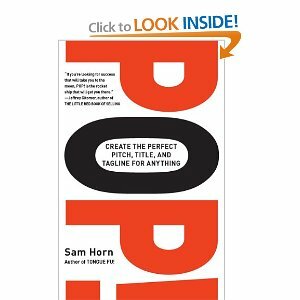 (an acronym which stands for Purposeful, Original and Pithy) provides some great suggestions on how to arrive at the “perfect pitch, title and tagline for anything.” She has many effective techniques in her book but the foundation is most often based around her W9 Form and Core Words. W1: What am I offering? W2: What problem does my idea or offering solve? W3: Why is it worth trying and buying? W4: Who is my target audience? W5: Who am I and what are my credentials? W6: Who are my competitors and how am I different from them? W7: What resistance or objections will people have to this? W8: What is the purpose of the pitch? W9: When, where and how do I want people to take action? Answering these questions will help accomplish the first “P” in POP! — Purposeful. To help with the “O” and the other “P” try writing down your list of “core words.” These are words or “descriptive phrases that articulate the essence of your offering.” For example, if you’re a BBQ restaurant you might choose core words and phrases such as: meaty, fall-off-the-bone, slow-smoked, family recipe, award-winning or dry rub. Then, look for ways to twist, update, rhyme or combine your core words into a POP!-worthy name or slogan. Another naming strategy to keep in mind caters more to how most people search for products or services — online. If you’re marketing a Web site, you may be better off naming your site how people would search for it online. This strategy will help you index higher on the search engines. For example if you’re all about things to do in Tampa Bay, resist the temptation to go for clever and go with: tampabay.com/things-to-do which is what the team at the Tampa Bay Times did with good results. If it seems like all the good names are gone, you could coin your own like Google or Verizon, however be prepared to put a lot of money behind it to plant it in the consumers mind, or create the world’s most dominant online search tool. Search Tool…now there’s a decent band name. 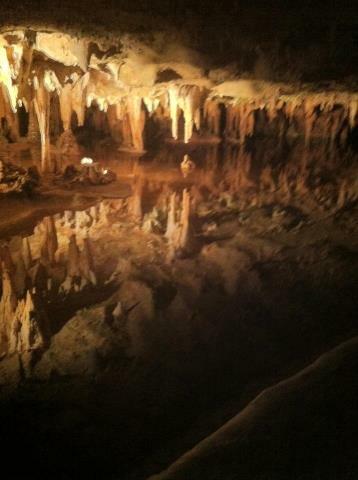 Here’s a cool picture taken at Luray Caverns in Luray, VA. It appears to be an identical set of stalagmites (trying with all their might to get to the ceiling) and stalactites (hanging on tight from above). In reality, it’s a set of stalactites and their reflection in a perfectly still pool of water. The reflection reminded me of a marketing insight I recently picked up from branding guru, Martin Lindstrom. In his book Buyology, Lindstrom explains the concept of mirror neurons in the brain and how they may influence our behavior. In short, the theory is that mirror neurons fire in your brain when you yawn simply because you’ve seen another person yawn: even though you’re not the least bit tired. Or, when you watch an exciting car chase in a movie and you end up driving like a mad man on your way home — I confess I’ve mirrored this behavior and luckily have lived to tell about it. So, if you’re trying to influence behavior, show someone in your target audience consuming your product and you just might fire the mirror neurons in their brain to do the same thing. This seems like an obvious move, but for some reason we marketers sometimes go with the more obtuse choices for visuals. The mirror neurons theory has its doubters but I think there’s truth to it — they did outlaw showing people smoking and drinking alcohol in TV commercials for a reason. 10,000 free miles or a trip to Hawaii? On a recent plane trip, the flight attendants were parading up and down the aisle attempting to get passengers to sign up for mileage program. “Sign up today and get 10,000 miles FREE.” Having just finished the book Made to Stick, by Dan and Chip Heath, I thought ‘This not a sticky message.’ How about if the flight attendants said “OK, who wants a free trip to Hawaii?” I’m certain that would’ve received more attention than the offer for free miles. How about if the flight attendants were wearing leis or better yet, passing them out to the passengers? The point is, be specific when you’re trying to get your message across. Conjure up an image in people’s mind by telling a story and say Aloha to success!